A dual-head display is two display devices driven by a single computer, where each display shows different content. For example, when giving a presentation, one display is a video projector that shows your slides and the other a local screen with your workspace. 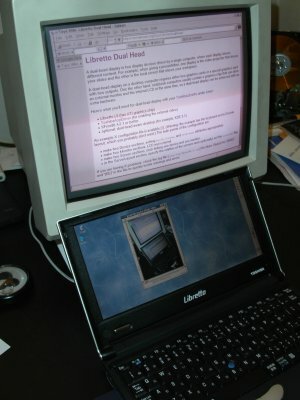 A dual-head display on a desktop computer requires either two graphics cards or a special graphics card with two outputs. One the other hand, notebook computers usually contain a graphics chip that can drive an external monitor and the internal LCD at the same time, so a dual-head display can be achieved with no extra hardware. Libretto L5 (has ATI graphics chip) with stock XFree86 driver (4.2.1 or better), or Libretto L1-L3 (S3 graphics chip) with [Duoview driver]. If you are having X problems, check the log file (/var/log/XFree86.0.log) for clues. Search for "(WW)" and "(EE)" in the file to quickly locate warnings and errors. Use the following command to enable the external display. It seems like this must be done before starting the X server for dual-head to work. Xinerama is a dual-head mode were you can naturally drag windows from one display to the other. If xinerama is not enabled, each display will act as a separate desktop. In that case, you can select which display an application will appear in by setting the X DISPLAY variable to ":0.0" or ":0.1" when launching the application.